Burgess Hill Town joint caretaker boss Simon Wormull believes the Hillians may have turned a corner. The 3-1 win over Haringey Borough was the Hillians first league win of the season and Wormull was pleased to put on a show for the big crowd at the Green Elephants Stadium. A delighted Wormull said afterwards: “Because of Non-League Day we must have had 150 people here today who’d never been here before. "What we did was put on a show for them. The chances we created today gives everyone something to believe in. The victory still leaves the Hillians at the foot of the Bostik premier but the manner of this performance suggests they won’t be down there for much longer. Hillians, playing in front of a noisy crowd of 651 boosted by a one pound admission fee to celebrate Non League Day started brightly but before long Boro took control and the Green Army must have feared the worst. Hill keeper Josh James made a series of fine saves as Haringey turned up the heat. He was helped by his skipper Gary Elphick who threw himself in front of everything – and when he was beaten by a curling Josh Nouble effort he was rescued by the bar. It was against the run of play when Keiron Pamment opened the scoring on 31 mins. A cross from the right by Aaron Smith Joseph was only half cleared by makeshift right back Coby Rowe and the Hillians number 7 reacted to the ricochet first to fire home. The goal lifted the men in green and black and they were on top going into the break. 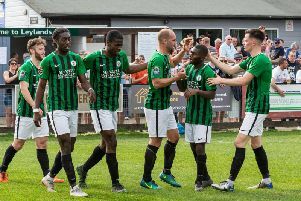 The second half though began badly for Hillians when Nouble’s speculative shot somehow eluded James in the Burgess Hill goal and Boro were level. It was such a soft goal the visitors looked embarrassed to celebrate it. But the north Londoners were only to enjoy parity for two minutes before Hillians took the lead again. Good work along the edge of the Boro area by Pamment who’s square pass wrong-footed the Boro defence but it still took a fine finish from Lucas Franzen Jones whose right foot shot went in off the post to Cameroonian keeper Pajetat’s left-hand side. From then on it was one way traffic especially down the Haringey right as Aaron Smith Joseph especially exploited Rowe’s weakness in that position. So it was no surprise when the killer third goal started with a move on that same side as Smith Joseph crossed leaving what should have been a simple tap-in for Pamment. The ball got stuck under his feet but Pat Harding was there to score from close range in the 91st minute to put a gloss on the score that Burgess Hill thoroughly deserved. Hillians are now unbeaten in three in all competitions and will go in to Tuesday’s home match against Wingate and Finchley with real optimism as the Green Army believes again.